Blowout Sale! 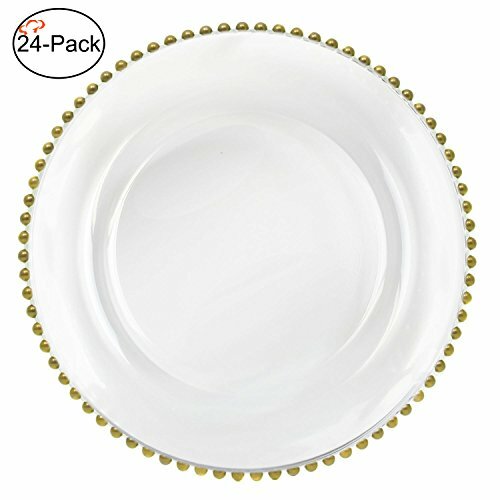 Save 55% on the Tiger Chef 13-inch Gold Round Beaded Glass Charger Plates Set of 2,4,6, 12 or 24 Dinner Chargers (24-Pack) by Tiger Chef at Foom App. MPN: plate chargers glass. Hurry! Limited time offer. Offer valid only while supplies last. Set the tables at wedding receptions, anniversary dinners and other formal affairs with the Tiger Chef Round Clear Beaded Glass Charger Plate 13''. Set the tables at wedding receptions, anniversary dinners and other formal affairs with the Tiger Chef Round Clear Beaded Glass Charger Plate 13". Sophisticated and with a timeless, classic design, this charger plate will complement many decors and color schemes. Crafted of durable glass, with understated beauty, this charger features beaded accenting along the rim and a luminous glass construction that will look stunning on any tabletop. Easy to wash and reuse as needed, this durable charger will find many decorative uses in your restaurant, hotel or catered event. Charger plates are back in style and add chic elegance to the formal table setting. Charger plates are decorative plates that act as a base on which serving bowls and dishes are placed and are usually removed after the appetizers and first course are cleared off the table. Other times, when the design of the charger plate complements the design of the dinnerware, the charger plates may be left on the table throughout the course of meal, until dessert, at which time they are always removed. Shop Tiger Chef's lovely selection of charger plates available in many designs and colors on Amazon. - ELEGANT DINING: Sophisticated, and with a timeless, classic design, this charger plate will complement many decors and color schemes. - COMMERCIAL QUALITY: Made to last, these dinner plate chargers are perfect for enhancing table settings at your weddings, banquets, catered event, restaurant, hotel etc.